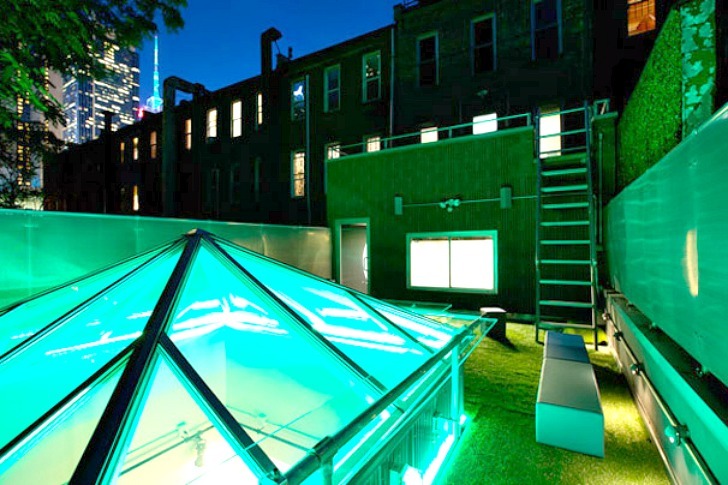 A dazzling neon LED light sculpture recently popped up on the formerly uninhabited Midtown office rooftop of the radio promotion company S.I.N (Street Information Network). Known for helping launch many music giants, including Lady Gaga, S.I.N. opted to make use of the rooftop's existing architectural elements in an innovative mix of art, light and modular furnishings curated by contemporary design firm Cezign. The renovated brownstone bordering Hell’s Kitchen on 353 West 46th Street originally housed a brilliant geometric skylight on its rooftop terrace and Cezign foresaw its great potential. Cecilia Dupire, design principal at Cezign, made use of the unique prism by transforming it into a glowing LED light sculpture that creates a dazzling array of energy-efficient lighting effects. The beaming skylight is wrapped with a bar for socializing and bordered with moveable furnishings to fully utilize the surrounding space. The building’s interior was also retrofitted with transitioning magnet and dry erase walls, reconfiguring the space seamlessly and instantly for a multitude of purposes. Lightweight and slender bespoke furniture peppers the space and is easily transformed for any situation. The remainder of the design is minimalist in nature with the street-facing windows acting as the interior’s focal point. Wow!! This looks so amazing!! The office bordering Hell's Kitchen on 353 West 46th Street originally housed a brilliant geometric skylight on its rooftop terrace and Cezign foresaw its great potential. The beaming skylight is wrapped with a bar for socializing and bordered with moveable furnishings to fully utilize the surrounding unused space. The designers made use of the unique prism by transforming into a glowing LED light sculpture. The building's interior was also retrofitted with transitioning magnet and dry erase walls, reconfiguring the space seamlessly and instantly for a multitude of purposes. Lightweight and slender bespoke furniture pepper the space and are easily transformed for any situation. The remainder of the design is minimalist in nature with the street-facing windows acting as the interior's focal point. A drab kitchen gets a revamped minimalist style, showcasing the LED skylight on the outer terrace.